Anyone following this movie series (And judging by the billions of dollars grossed, there’s a lot of you) will notice the series has felt a little uneven. The first two films, helmed by Christopher Columbus, were very straightforward adaptations of the books, made so that little was left out. However, because of the stringent adaptation style of the original two movies, there was little to no room for character development. Yes, the movies followed the books, but they felt somewhat empty. Then, the acclaimed Mexican director Alfonso Cuaron took the reigns for the third film, Harry Potter and the Prisoner of Azkaban. Cuarón chose to do a more stylistic approach, doing a less faithful adaptation, but doing lots more character development and giving the movie better pacing. 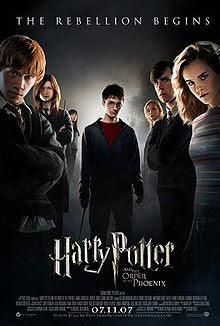 This worked tremendously well, and after British director Mike Newell absolutely butchered the Goblet of Fire movie, favoring awful slapstick humor over character development, it seemed like Prisoner of Azkaban would be the closest we’d ever get to a perfect Potter movie. For the fifth Potter adventure, Warner Bros. chose Director David Yates to helm the project, and Yates brought in some new talent that makes this Potter film far and away the best one yet. For starters, Yates replaced screenwriter Steve Kloves with screenwriter Michael Goldenberg. Goldenberg is a freaking god-send to this series. For one, he really understands the characters, and that is more important than anything else in a Potter adaptation. He has obviously studied the books closely, and really knows who these characters are. For the first time in this series, we can look at these characters and really get the feeling they are the people they’re supposed to be. Goldenberg also decided to do a melding of strict adaptation with a stylistic approach, and it works wonderfully. He takes all the most important sub-plots and elements from the book, and reworks it into a well-paced 2 hour adventure that is always fun. His adaptation works because he ties every plot into Harry’s inner struggle with himself. Like in the book, Harry is angry for being kept out of the loop all summer, frustrated that no one believes that Voldemort is back, and has a fear that he himself is starting to become evil. Like I said before, Goldenberg understands all the characters, but his understanding of Harry himself overshadows all of them. He gets what a deep and troubled character Harry really is, and makes that the main point of this movie. He takes a 900 page book and works it into a movie only a little over 2 hours, and it works better than all the other movies because, although a wizard, Harry really strikes a chord with us muggles. He’s human, above all else. Yes, there are deep cuts. Much of the book is missing here, but the thing is, you don’t miss anything, and that’s what’s important. The Harry Potter books are my favorite books of all time, and I’ve read each one at least twenty times. My favorite book is the one which this film is based on, and so it would take a lot to win me over with this film. Surprise of all surprises, it feels 10 times more faithful than all the other films combined. I know I sound like a broken record, but this is because of how deep the characters are---just like the book. And the characters work not only because of the writing, but because of the acting. I’ve never thought Daniel Radcliffe was the perfect Harry Potter, but he proves he is in this installment. He really gets his chance to shine in this one, and he does it brilliantly. Potter feels like a real, down-to-earth teenager with normal adolescent problems this time, and it’s because Radcliffe has finally found in himself the perfect performance. Rupert Grint returns as Ron, and as always, is lots of fun to watch. I can see this kid having a long and successful acting career; he’s funny, charismatic, and feels like a real teenager. Emma Watson....well, she’s perfectly watchable this time as Hermione. Under Yates direction, she finally restrains herself and doesn’t overact. I still think there are probably better actresses for Hermione out there, but she’s finally finding the role. Too bad it took 5 movies to do so (NOTE FROM THE FUTURE: Present-day Jonathan atually believes Emma Watson was the absolute best part of the Potter ensemble – I have no clue what I was thinking back in 2007. Sorry Emma!). But a few of the adult actors really steal the show. Most notably is Imelda Staunton as the wickedly evil Delores Umbrige, sent by the Minister of Magic to teach Defense Against the Dark Arts and slowly but surely brainwash the Hogwarts students out of any creative thinking they might have. Umbrige is a great character in the book, and the main reason why Order of the Phoenix is my favorite book. She’s a character you absolutely love to loath, and Staunton gives an absolutely PERFECT performance. She just IS Umbrige. Returning cast members Robbie Coltrane (Hagrid) Alan Rickman (Snape) Maggie Smith (McGonagall) Michael Gambon (Dumbledore) David Thewlis (Lupin) and Brendan Gleeson (Mad-Eye Moody) all excel in their respective roles as well. But the most noticeable returning cast member is Gary Oldman as Harry’s Godfather, Sirius Black. Missing in Action in the dreadful fourth movie (which is one of the reasons the movie failed so miserably) Sirius is back here, pulled straight from the pages of the book. He has some very tender, emotional scenes with Harry, acting as the only father figure Harry has. If you know Black’s eventual fate, there are a couple of scenes where you might just tear up, as I did. Ralph Fiennes also returns as Lord Voldemort, and is once again the perfect man for the job. This is one bad dude, and Fiennes really shows this. Order of the Phoenix is the Harry Potter movie fans of the books have been waiting for, the Holy Grail of Potter movies. Yes, lots of stuff is cut out, but when its over, you feel as if you’ve just seen the book itself being projected onto a theater screen. The book is excellent, and as such, the movie is. Plus, the movie is made so that people who have not followed the books will have no trouble understanding the movie. Quite an impressive hat trick, I must say. It more then makes up for the abomination that was the Goblet of Fire movie, but some people who didn’t read the Goblet of Fire book might have trouble understanding a few elements here. “Order of the Phoenix” is made as a sequel to the first four books, not as a sequel to the last movie. It really ignores the Goblet of Fire movie, and trusts that either you’ve read all the books, or have watched the first three movies and read the fourth book, which was an excellent choice. Yates is going to direct the next Potter movie, and I’m very excited that he is. So grab you broomsticks and fly to the theater as fast as you can; this is the can’t miss movie of the summer.